Well, perhaps that is not entirely true. It was not my own personal birthday cake, but since I too was officially presented to the public way back in 1971, I have always felt as though each and every Walt Disney World “Birthday” celebration is also a celebration of my very own. 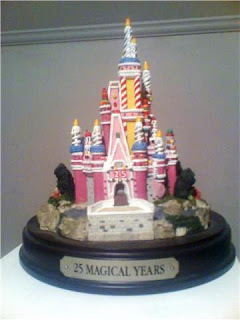 Who can forget (although I know some out there would like to) the 25th Anniversary transformation of Cinderella Castle into an 18 story Pink Birthday Cake which decorated The Magic Kindgom from October 1, 1996 through January 31, 1998? Now, as I mentioned, I realize that there are those members of Disney World fandom who still have nothing complimentary to say about the castle “Cake” makeover, but whether a fan of it or not, no one can deny it was an impressive undertaking. To transform what is arguably the most recognizable building in the world, certainly the most oft photographed, into a candy laden, iced and sprinkled, 188 foot birthday cake was a feat only the mind of an Imagineer could bring to life. The “Cake” had its fans and its critics. Among the “critics” were the multitude of couples who cancelled their Disney Fairytale Weddings due to what they considered an eyesore in view of their dream wedding. As a fan of the Cake, and someone who had their wedding at Disney World, I might have to agree that it would have detracted from the view on that, one of the most special days of my life. As a guest at Walt Disney World, who was in fact celebrating his own 25th Birthday in 1996, I was quite impressed and enjoyed the “Cake” immensely. 26 candles, which ranged in height from 20 to nearly 40 feet tall. So, I suppose the best way to put is that I was then, and remain today, a HUGE fan of the concept, if not necessarily the total execution of the overlay. (Pink is simply NOT my color I suppose). I even went so far as to grab a little piece of the cake for myself to enjoy in years to come… In the end was quite frankly, I think it was one of those things that could only happen at Disney. The Cake was amazing. It was a once-in-a-lifetime treat for us Disney fans! Should we start our own Cake Fan Club? I personally thought the cake was cool when we visited that year. I too do not mind it as long as it is not a permanent change. I hadn't been to WDW for several years and finally got to return for my honeymoon. When I arrived, instead of my beloved Cinderella Castle, I saw this. I was heartbroken. The fact that they finally took it down didn't help infrequent visitors or people who wanted the real castle in their once-in-a-lifetime photos.